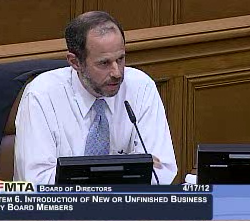 SF Taxi Media: MTA Board To Hold Lengthy Taxi Discussions In Either Mid May Or June. By John Han. MTA Board To Hold Lengthy Taxi Discussions In Either Mid May Or June. By John Han. April 17, 2012 MTA Board meeting. Ed Reiskin, Director of the San Francisco Municipal Transportation Agency (SFMTA), said Tuesday that his agency would hold public discussions for "a host of taxi-related matters", either in mid May or early June. At Tuesday's regular Board meeting, April 17, 2012, Reiskin said a discussion on credit card fees, electronic waybills, back seat monitors, police code and legislative changes, and medallion sales would be on the agenda for the meeting scheduled May 15th. He added that a study for public convenience and necessity, that includes recommending whether to add more cabs in the City, involves an environmental impact study and would be ready this fall. But during the meeting's public comment Reiskin corrected himself, saying that the taxi issues may not be heard until the first week of June instead. "Whenever it is, we will make sure to do outreach to all of the stakeholders", Reiskin said. "I think our intent is to try to keep the agenda as clear as possible of non-taxi items, so that we can focus on the many and challenging taxi issues that we're going to be facing." SFMTA Board Chairman Tom Nolan added, that he would like to have a specific time set in the meeting to begin the discussions, so that people would know what time the discussion start, and not have to first sit through hours of non-taxi items. If those were to be the case, that could come as good news to long-time taxi advocate Barry Taranto. During public comment, Taranto said, "I think it's important to make sure you schedule enough town hall meetings, so enough of it is vetted out by the industry and the stakeholders before it comes before the MTA. We could have people coming here and screaming we never got a chance to look at this". and At the, among others.